Another history of London Woodard and his church. Rocky Mount Telegram, 29 January 1960. London’s Primitive Baptist is possibly the oldest African-American church in Wilson County. London Woodard was born in 1808. In 1827, James Bullock Woodard purchased him for $500 from the estate of Julan Woodard. In 1828, London Woodard was baptized at Toisnot Primitive Baptist. In 1866, he sought permission to preach among his people. In 1870, he was “dismissed” from Toisnot so that he could pastor the church he founded. He died lass than a month later. London Church appears to have become disorganized after Woodard’s death, but in 1895, Toisnot P.B. dismissed several “colored brethren and sisters” who wanted to reestablish worship at London’s. The same year Union (now Upper Town Creek) P.B. released Haywood Pender, George Braswell, Dublin Barnes, and couple Charles and Rebeckah Barnes for the same purpose. Many “old-time colored Christians” remained members of the churches they attended during slavery. Their children and grandchildren, however, gradually formed separate congregations. 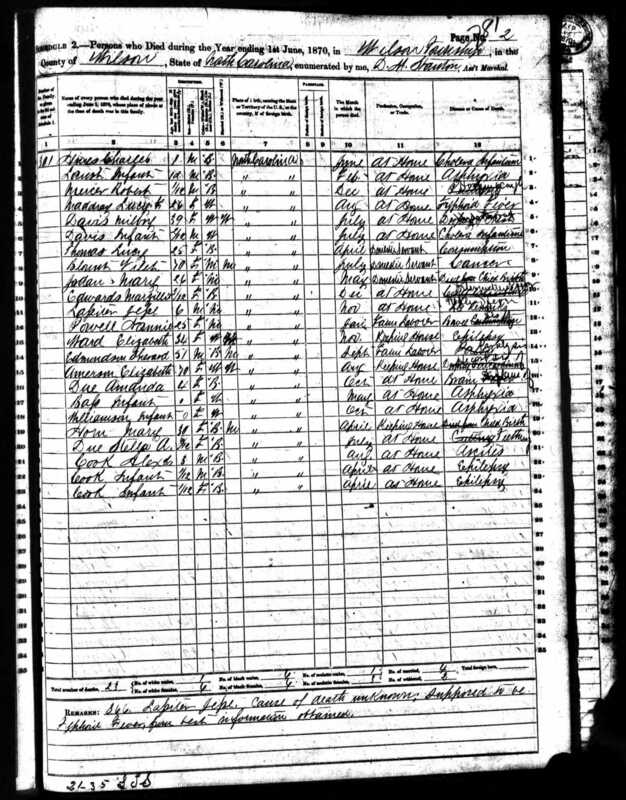 Haywood Pender — in the 1900 census of Toisnot township, Wilson County: Haywood Pender, 50, farmer; wife Feraby, 45; children Mollie, 39, and Ann, 8; and grandchildren Gold, 5, Nancy, 3, and Willie, 16. Haywood Pender died 15 July 1942 in Elm City, Toisnot township. Per his death certificate, he was born 6 October 1852 in Wilson County to Abram Sharp and Sookie Pender; was a farmer; was a widower; and was buried in Piney Grove cemetery, Elm City. Dublin Barnes — in the 1880 census of Toisnot township, Wilson County: farmer Doublin Barnes, 25; wife Eliza, 21; daughter Sattena, 2; and Jane Thomas, 12, farmhand. Charles and Rebecca Barnes — in the 1900 census of Wilson, Wilson County: farmhand Charley Barnes, 50; wife Rebecca, 57; and children John, 26, William, 23, Annie, 17, Tom, 18, and Corah, 12. Rev. Joseph C. Price, educator, orator, civil rights leader. Rev. Joseph C. Price‘s extraordinary career began in 1871 as principal of an African-American school in Wilson, likely Wilson Academy. Rev. Joseph C. Price (1854-1893). 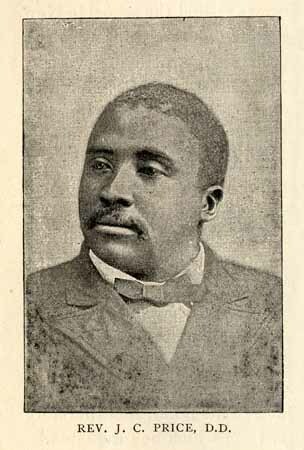 “Joseph Charles Price, black educator, orator, and civil rights leader, was born in Elizabeth City to a free mother, Emily Pailin, and a slave father, Charles Dozier. When Dozier, a ship’s carpenter, was sold and sent to Baltimore, Emily married David Price, whose surname Joseph took. During the Civil War, they moved to New Bern, which quickly became a haven for free blacks when it was occupied by Federal troops. In 1863 his mother enrolled him in St. Andrew’s School, which had just been opened by James Walker Hood, the first black missionary to the South and later the bishop of the A.M.E. Zion Church. Price showed such promise as a student at this and other schools that in 1871 he was offered a position as principal of a black school in Wilson. 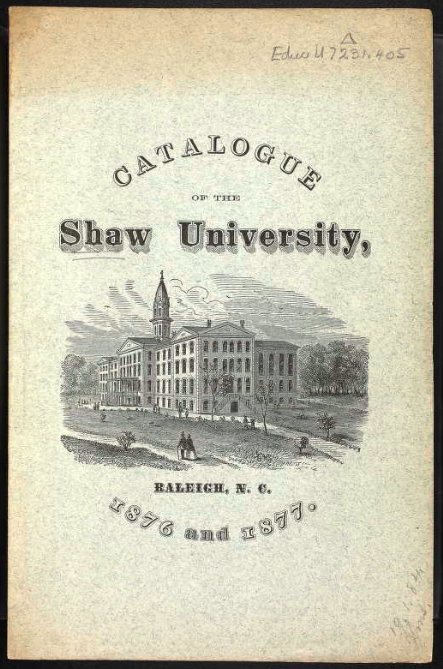 He taught there until 1873, when he resumed his own education at Shaw University in Raleigh with the intention of becoming a lawyer. But he soon changed his mind and transferred to Lincoln University in Pennsylvania to study for the ministry in the A.M.E. Zion Church. He was graduated in 1879 and spent another two years at its theological seminary. During this period, he married Jennie Smallwood, a New Bern resident he had known since childhood. They were the parents of five children. Text (citations omitted) from Joseph Charles Price, www.ncpedia.org. A closer look at the 1872 map of Wilson. In a post about the 1872 E.B. Mayo map of Wilson, I erroneously stated that Lemon Taborn‘s barber shop was the only African-American landmark depicted. A close look at a clearer image of the map revealed two others. Tilman McGowan‘s house was on Vance Street northwest of Pine Street. McGowan was the long-time jail keeper in Wilson. His house and the lot on which it was situated were sold at auction after McGowan’s death. On Tarboro Street, west of Barnes, there is a reference to “Jack Williams Black Smith Shop,” which is likely to have been the workshop of blacksmith Jack Williamson. I have been unable to identify Lucy Ricks. 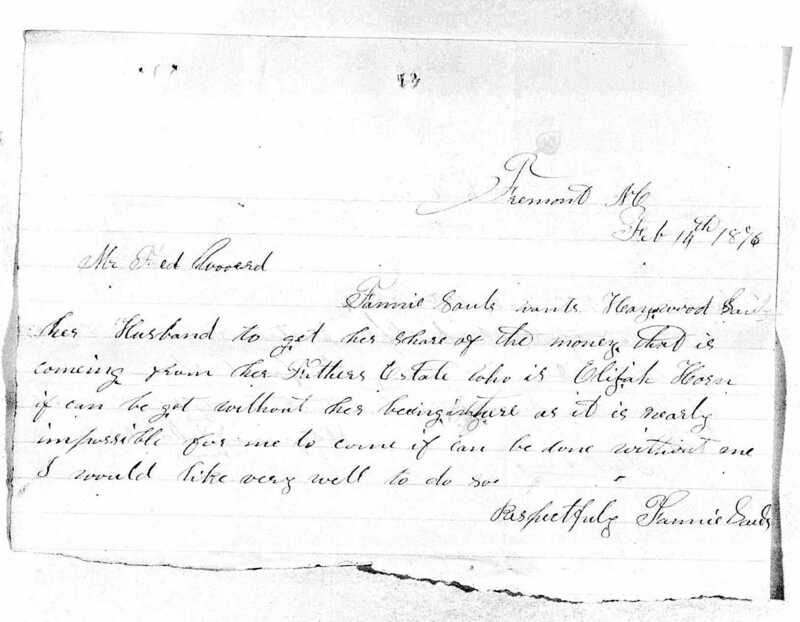 Washington Suggs’ first real estate transaction. If the graveyard lot is, as it surely appears, the cemetery later known as Oakdale, this deed pushes the founding date of that burial ground back more than 25 years. The African church appears to be the church later known as Jackson Chapel (and later still, after a merger, as Jackson Chapel First Missionary Baptist Church), which was located on Barnes Street just off Pender Street (then Stantonsburg Street), a block south of Nash Street. If so, this deed pushes back the date of the building of the congregation’s first edifice. Deed book 4, page 135, Register of Deeds Office, Wilson. The estate of Elijah Cox. Less than a decade after gaining freedom, Elijah Cox passed away in southern Wilson County. He had assembled a small farm in Cross Roads township, but it would not pass intact to the next generation. Dr. R.E. Cox filed a claim against the estate for medical care provided in Elijah Cox’s final illness. 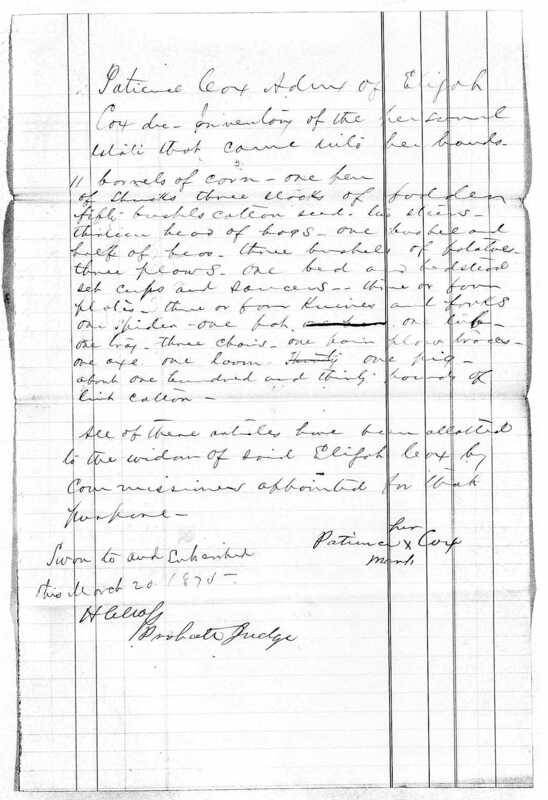 In 1874, Patience Cox applied for letters of administration in Wilson County Superior Court for her husband’s estate. His heirs were named as Haywood Sauls and wife Fannie; Sherrod Cox and wife Diana; Simon Dew and wife Telitha; Jerry Everett and wife Jane; Ben Barnes and wife Hester; Ben Cox; William Horne; and Warren Barnes. His estate file reveals that Cox owned about 56 acres at his death and that his debts were estimated at $175. For her support, Patience Cox was allotted barrels of corn, shucks, fodder, cotton seed, cattle, hogs, peas, potatoes, garden tools, plows, and household and kitchen furniture, which essentially wiped out Elijah’s personal property. As a result the court ordered Cox’s land sold to create assets to pay off his debts. 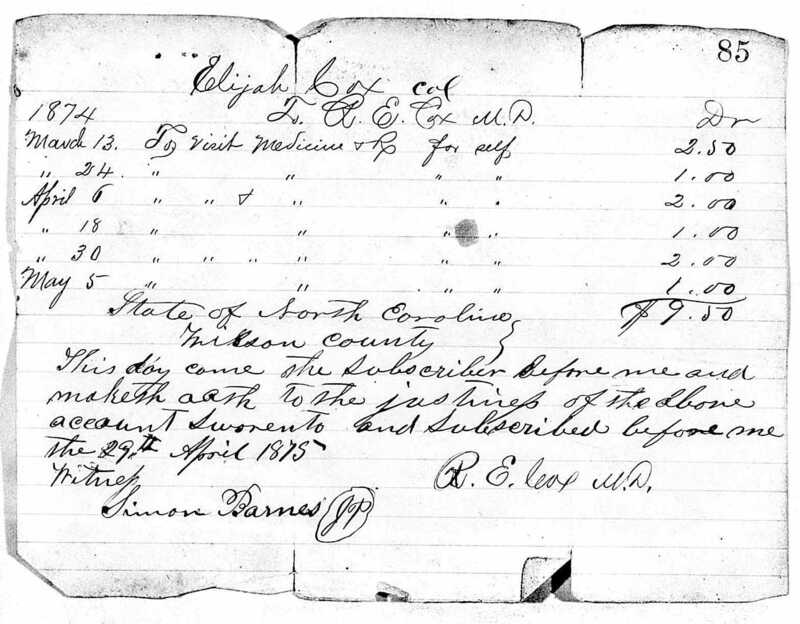 Inventory of Elijah Cox’s estate. 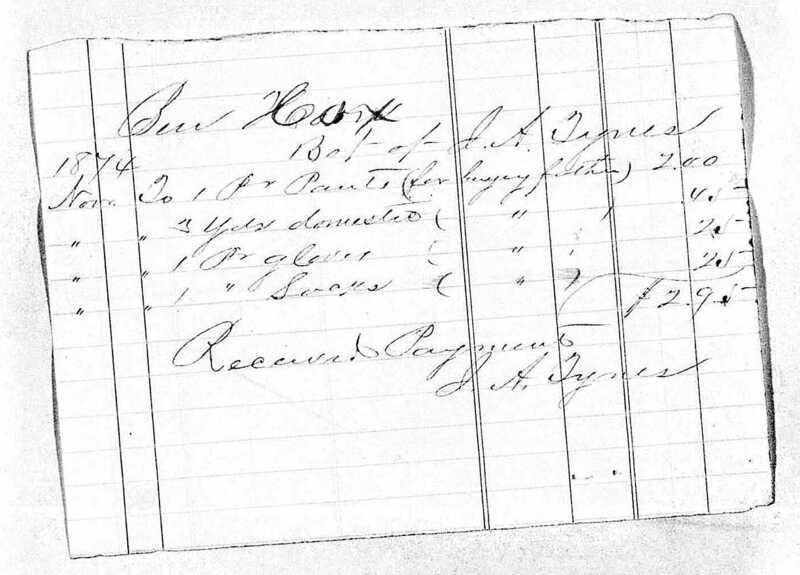 In a final accounting after the sale, heirs received payments of about $16 in February 1876. Request from Cox’ daughter Fannie Sauls of Fremont, Wayne County, to have her share delivered via her husband Haywood Sauls. In the 1870 census of Cross Roads township, Wilson County: shoemaker Elijah Cox, 66; wife Patience, 65; and children (or grandchildren) Jerry, 11, Clara, 5, and Patience Cox, 3. Cox claimed $150 real estate. In the 1880 census of Cross Roads township, Wilson County: farmer Ben Jamin Horne, 33; wife Mandy, 26; and children William Henderson, 14, Alvester, 10, Hilliard, 8, Amos, 6, and Louetta Cox, 3; and mother Patience Cox, 70. In the 1880 census of Wilson township, Wilson County: wagon driver Haywood Sauls, 46, and wife Fannie, 56. In the 1880 census of Black Creek township, Wilson County: farmer Simon Dew, 55; wife Lithy, 48; children Lany, 27, Peter, 25, Lucy, 23, Diannah, 21, Isaih, 20, Hilliard, 18, Hester, 16, Aarch, 14, Liscy, 12, Patience, 10, Sarah, 8, and Simon, 6; and grandchildren Zilpha, 13, Roxie A., 2, and William, 1. 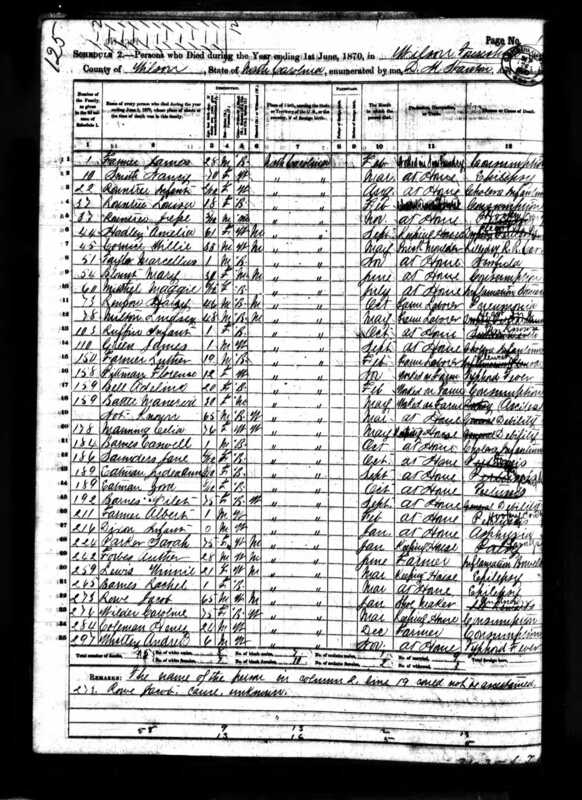 In the 1880 census of Black Creek township, Wilson County: farmer Benjaim Barnes, 52; wife Hester, 52; and children Ervin, 17, Rebecca, 16, Bettie, 13, Larry, 10, Thomas, 8, and Benjaim, 6. Called out and shot at. Daily Charlotte Observer, 11 December 1878. Raiford Yelverton married Eliza Locust in Wayne County on 17 January 1869. In the 1880 census of Nahunta township, Wayne County: farmer Raford Yelverton, 30; wife Anne M., 26; and daughter Mary J., 14. Rayford Yelverton died 9 December 1917 in Nahunta township, Wilson County. Per his death certificate, he was 84 years old; married; a farmer; and was born in Wayne County to Adam Outland and an unknown mother. William Locus of Stantonsburg was informant. Mary Susan Artis died 7 November 1958 in Oldfield township, Wilson County. Per her death certificate, she was 85 years old; born in 1873 to Raiford Yelverton and Barbara Locust; and was a widow. Her informant was Mary E. Applewhite of Lucama.